Solar LED Street Lighting System harness energy from the sun to provide an alternative source of energy to conventional street lighting. Solar LED Street Lighting System is manufactured, exported and supplied by us that range from 9W to 18W with advanced electronic circuit design for high efficiency and high brightness. Made with using top-quality LEDs, SMD fabricated circuit design electronics for high reliability and long life. Our Solar LED Street Lighting System has high efficiency LED drivers and dusk to dawn operation controller which uses less power, and thus battery charge is retained for much longer hours. 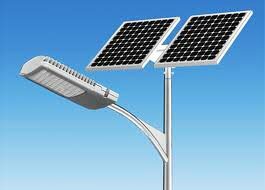 Solar LED Street Lighting System, offered by us, consists of a SPV Module, luminaire, battery and with battery box. The SPV Modules convert solar energy to electrical energy during the day, which in turn is used to charge the battery. At dusk the LED light is switched "ON" automatically and switched.